The word tripe will bring one of two reactions usually, the question what is tripe? Or, l the look passing over their face telling you instantly whether tripe is something they like or not. Here in Britain, tripe was once far more popular than it is now. It is still eaten but mainly by older people - they are more used to the taste and texture, having grown up eating it. Personally, tripe is one of the few foods I am not so keen to eat. There is nothing offensive in the flavor - in fact, it is quite bland and requires much seasoning to lift the flavor - it is the texture I dislike. Tripe is cheap to buy, nutritious to eat and helps cut down waste. With these three components currently very popular, there have been several initiatives to encourage eating tripe. Unfortunately, it is not happening despite Nose to tail eating being highly popular. There exists in the UK is a Tripe Marketing Board, their purpose being to educate the British public in bringing back the cooking and eating of tripe as part of a healthy, balanced diet. Though in decline here, tripe continues to be popular in Europe. You will find it in Italy and France where it is considered a delicacy. Tripe is the stomach lining of animals, usually beef (ox is considered the best) but can also come from pig or sheep. 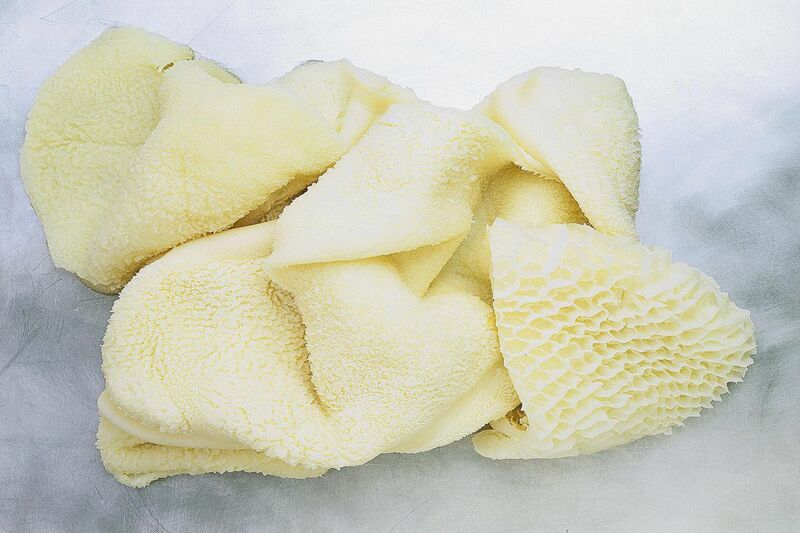 Different stomach linings produce a different texture, honeycomb tripe being the most popular. The lining of the stomach (tripe) needs to be prepared before being put on sale. The tripe is bleached and partially cooked before being sold, but will require further cooking for a further two hours before eating. Tripe and onions were once a very popular recipe in British cooking and considered the best way to cook the tripe (no doubt the onions bringing much-needed flavor). Boil the tripe squares in water for 15 minutes then drain. Add the onions and enough milk to cover and cook for two hours over a low heat. Melt the butter and flour together and stir to create a thick paste then slowly whisk in the milk form the tripe to create a white sauce. Season well with salt and pepper. Add the tripe squares, reheat and serve. Tripe juice is good for a hangover. Wrap your head with tripe and cover with a swimming cap for a cure for hair loss.